Over a year after first demanding BT make its ducts and poles available to third parties Ofcom has announced it really means it. “Ofcom has today set out detailed plans for improving access to Openreach’s infrastructure, making it cheaper and easier for competing providers to connect their own fibre broadband directly to homes and offices,” said the announcement. Those plans are apparently the culmination of a consultation commenced at the end of last year. 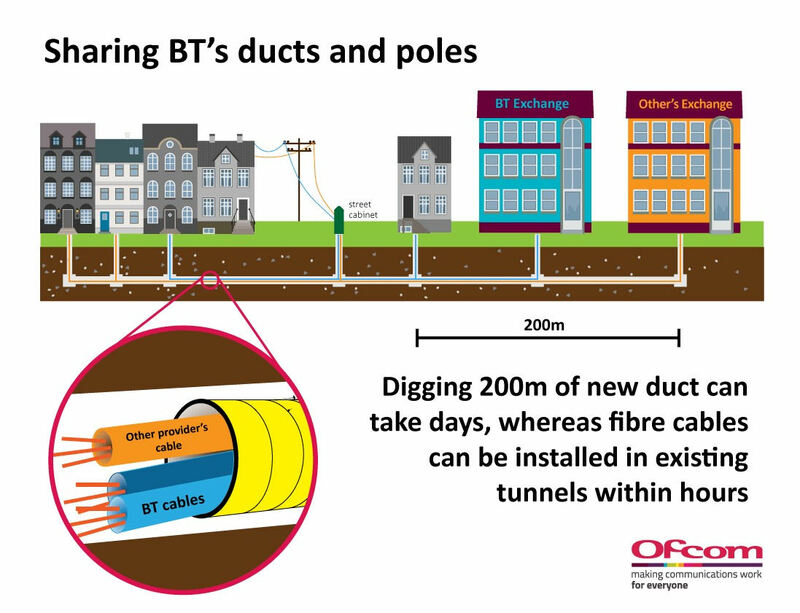 To recap: the thinking is that another way to improve competition among UK ISPs is to give them access to BT’s ducts, rather than having to dig their own, which is prohibitively expensive. So now the likes of Sky, who constantly moan about Openreach, can create their own fibre networks, and thus be no longer beholden to the hated wholesaler. In practice, even if they don’t have to do any digging there would still be a lot of cost associated with such a move so the more pragmatic business approach remains leasing infrastructure from BT and trying to reduce the cost by the power of moaning. In case you’re still struggling to get your head around the concept, Ofcom provided the handy diagram below.